The word ‘globalism’ is often used in its narrowest context to mean global trade, which obscures its broader political intention to internationalize nation states and ultimately impose one-world government. Similarly the word ‘Islamism’ is often used in its narrowest context to mean a religion like any other which obscures its broader political intention to reestablish the caliphate and impose sharia law worldwide. Both are supremacist, expansionist socio-political movements intent on world dominion. Islamists like Globalists believe themselves and their supremacist tenets to be morally superior to all others. The Islamist cloaks his supremacy in religious fervor and the disingenuous conviction that Islam is a “peaceful” religion because peace to an Islamist means when all the world is Muslim. The Globalist cloaks his supremacy in a parallel and equally disingenuous conviction that Globalism is “tolerant” because tolerance to a globalist means tolerating those who LOOK different, not those who THINK differently. Both systems are tyrannical in their demand for absolute conformity to their proscribed rules of behavior – for Islamists it is religious sharia law and for globalists it is secular political correctness. Islamism and Globalism appear to exist on opposite sides of the political spectrum but they share a common enemy – the nation state. Nationalism is the single greatest obstacle to the religious caliphate of Islamism and to the secular one-world government of Globalism. The ancient proverb “The enemy of my enemy is my friend” explains the counter-intuitive common cause and intersectional alliance between Islamists and Globalists today. Disinformation is a deliberate tactic of war. The Islamist fiction that the annihilation of Israel will bring peace to the middle east is a unifying tactic of war designed to demonize Israel, manipulate public opinion, and garner intersectional support from left-wing liberal lemmings against Israel. Islamist disinformation has a name – TAQIYYA – lying in the service of Islam. It is a deceitful strategy that deflects attention from the Islamist end game of eliminating the left-wing liberal infidels who support them. Similarly, the disinformation campaign supporting the fiction that Socialism will bring justice to the United States also has a name – ALINSKIYYA –lying in the service of Socialism. The hippies and anarchists of the 60s did not go quietly into the night. They have reconstituted themselves as the professors, administrators, politicians, activist judges, and policy-makers adhering to well-defined Tavistock Institute principles of social engineering and mass indoctrination designed to disinform, destabilize, and destroy America from within. Whoever controls the information controls society – and whoever controls the educational curriculum controls the future. The essential question is WHY the Left is promoting communist values. The left-wing liberal agenda seeks to destroy the socio-political capitalist infrastructure of American democracy and transform it into a dependent socialist state with cradle to grave control by the government. Their strategy is to destroy the traditional American institutions of family, religion,, and education that promote independence, adulthood, individualism, and ego strength – all the qualities that made America great. The entire narrative of the Left is designed to induce regression through educational indoctrination and the media – as Hillary Clinton famously remarked they need “an unaware compliant public.” Unaware and compliant are the hallmarks of childhood. The sales pitch might sound good to a childish mind who is seduced by candy from a stranger but the adult mind understands the sinister end-game. Once the public is entirely dependent on the government they lose all individual rights and national sovereignty and the newly socialized state is poised to become part of an internationalized one-world government. That is the end-game of the globalist elite and the motivation for indoctrinating America toward socialism. The problem is that the left-wing liberal lemmings are too arrogant to understand that they are participating in their own destruction – they are just the useful idiots. The Left has been indoctrinated to believe they are fighting for “social justice” when in fact they are helping to establish the dystopian nightmare of one-world government where there is no middle class, no upward mobility, no national sovereignty, and absolutely no individual freedoms. There is only the master ruling elite and the enslaved population who service them. The left-wing liberal lemmings should take a break from marching and “resisting” and start reading Bertrand Russell’s The Impact of Science on Society written in 1952. They will learn that their script was written 65 years ago by the globalist elites who dreamed of their own one-world government – a binary socio-political system of masters and slaves. The globalist elite’s New World Order was their personal self-serving answer to the Malthusian problem of the earth not having enough resources to sustain the population growth. Tavistock Institute was exported to America after WWII with the specific purpose of indoctrinating Americans via education and the media – particularly television – the greatest vehicle for mass social engineering ever invented. The Hollywood glitterati and the protesting hoards should take a pause and understand there is no place for them in the New World Order – they are simply useful idiots who will be destroyed. The aristocratic Lord Bertrand Russell and the late David Rockefeller had no moral problem with eliminating the useless eaters anymore than Hitler had with exterminating Jews, Islamists with exterminating infidels, or the Chinese Emperors with burying their concubines alive to service them in the afterlife. The point is elitism is supremacist – there is no egalitarian respect for human life only the pretense of humanitarian considerations. 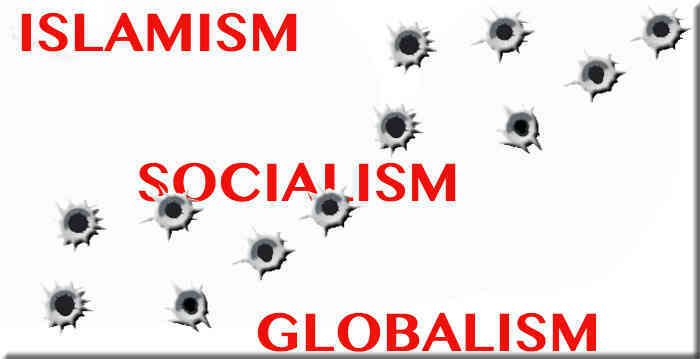 The Left and the Islamists have common cause in trying to destroy America from within – but it is the globalist elites who finance and disingenuously facilitate both groups because the social chaos they each engender is a prerequisite for imposing globalist one-world government. For the globalist elite the Left and the Islamists are BOTH useful idiots. The globalist elite play chess while the Islamists and Leftists/Socialists play checkers. With due respect to Santayana, perhaps we can say that those who love the mistakes of the past will condemn others to repeat them. A case in point is a new book published by MIT Press that’s actually titled Communism for Kids — I kid you not. Wow, I’ve never heard that one before. You mean, if I try touching the hot stove just one more time, it may not burn my hand? Speaking of capitalists, is MIT Press a for-profit operation? Just wondering. And before they know it, readers are standing in a bread line and having teeth pulled without Novocain. Of course, it never works out that way in real life — the “implementation” always fails — because Marxist doctrine thoroughly ignores the realities of man’s nature. First a little history. “Socialism” and “communism” were popularized via Karl Marx’ and Friedrich Engels’ 1848 pamphlet The Communist Manifesto; it is the definitive work on the matter. This is why the USSR wasn’t guilty of false advertising when calling itself the Union of Soviet Socialist Republics: “Communist government” is an oxymoron. It’s also an impossibility. Marx believed that all human suffering and woes were caused by economic inequality; thus, eliminate that inequality and there’s no crime or evil of any kind and hence no need for government. But man does not live on bread alone. He has moral and spiritual dimensions as well. Besides, the proverbs “Busy hands are happy hands,” “Work ennobles man,” and “An idle mind is the Devil’s playground” all warn of the perils that can attend wealth. It’s no cure-all. Then there are the perils of not allowing wealth. The “socialist revolution” fails because, absent the profit motive, people generally become slothful. Moreover, there can’t be the level of top-down control socialism entails without authoritarianism. And while leaders are typically worse than their people to begin with, moral individuals don’t rise to power’s pinnacle under such systems. The result? Despots such as Kim Jong Un, who clearly has greater “needs” than any other North Korean and luxuriates while his people languish. How could Marx believe something so ridiculous, that “economic equality” could not only be achieved but render government unnecessary? He likely was mentally ill. Note that he was infamous for not washing (common among the mentally ill) and exhibited that dangerous genius-insanity combination: impressive talents couple with dislocation from reality. So that’s Marx’ excuse. What’s MIT’s? Oh, I almost forgot. One more would be Communism for Dummies — because that’s what you’d have to be to, after a century of socialist failure, still believe the Marxist hype and tripe.